Spread on your bread and make your sandwiches! So those that have read my blog from when it began back in 2009 will see that my weight has yo-yo’d back and forth. It follows a typical pattern. I lose some, begin to feel a bit healthier, feel a bit happier, get complacent, start nibbling and before I know it I’m back to where I started. I did really well back in 2012 and managed to lose over 80 lbs living and breathing a wartime rationing plan (with only just a few blips) and I’d got down to just around 230 lbs ….just getting close enough to within a few months of making it below 200 lbs. When I think how close I was and how my weight was nearly at 300 lbs again at Christmas I could kick myself (but I’ve beaten myself up about it enough so I’m just leaving it in the past where it belongs). For the past month or so I’ve begun to knuckle down again. I’m not living and breathing a wartime rationing diet 100% at the moment BUT I am using rationing as a guide to keeping everything in check (although I am using far less sugar than rationing allows). Breakfast is nearly always porridge with ground flax seed and soy milk. Lunch is a large raw salad with romaine lettuce, beetroot, raw peas, tomatoes, cucumber, kidney beans and supper is either a large vegetable based stew or stir fry and sometimes I deviate away if my daughter has prepared a nice healthy meal for when I get in from work. I enjoy weekends as I have time to cook more new authentic wartime recipes and even bake something a little naughty using all that rationed sugar I am accumulating! I’m yapping on aren’t I…. WELL I weighed in this morning and I am now below 20 stone!!!! 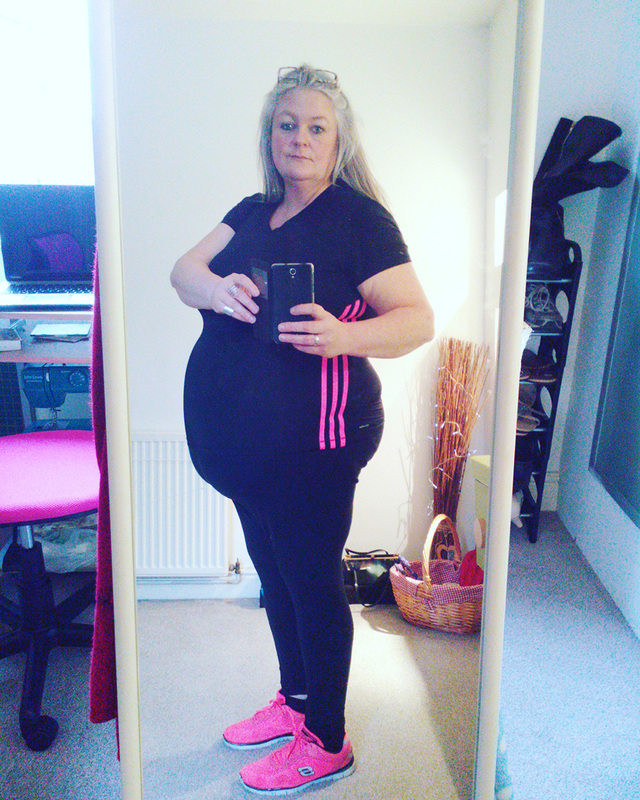 Today I was 279 lbs or if you like 19 stone 13 lbs which is 17 lbs off since January and 66 lbs off from my heaviest weight ever of 345 lbs several years ago. This is giving me a HUGE push forward psychologically as recently I have been a little stressed over various things. Not only am I pleased with the weight loss but I have broken the habit of raiding the cupboards/fridge overnight for 7 days now and am determined to continue. BUT I DON’T WANT TO BECOME COMPLACENT… so I took this photo above in the mirror just now to remind myself just why I want to get below 200 lbs. 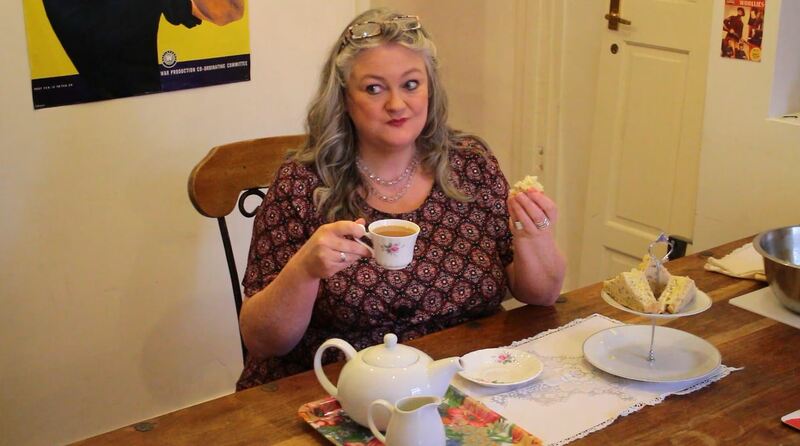 Weight-loss, no fridge raiding, pink china and cruel comments..
Did a blog Q & A with Tam Francis at ‘Girl in the Jitterbug Dress’ so my next post will be all about that! I will be asking Tam some questions too in the near future! Thank you for your supportive comments.. Thank you for all your very supportive and reassuring comments left on my last blog post and on my Facebook page too. I really have appreciated each and every one and have taken comfort in them and am feeling much more optimistic! Will be working hard towards good health in 2016, with a smile! For those of you that read my blog, you’ll know that I ended up with a nasty double pneumonia around New Year and was hospitalized in the USA (was on holiday). I’ve never been ill like that before..
To skip forward, with some great treatment in hospital things turned around quite quickly but after weeks of taking steroids, within days of stopping them my lungs began to get crackly again and I couldn’t lie down in bed. Doctor put me on a steroid inhaler and a regular inhaler with thoughts I am probably now asthmatic. She sent me back for a chest x-ray to make sure the pneumonia wasn’t returning. I felt fine apart from feeling exhausted..
With the x-ray done a few days later I began to get calls from the surgery, eventually we hooked up. My doctor had asked to see me on Monday (it was Friday) to discuss my x-ray. Of course when you get a phone call like that your mind goes crazy. And that’s pretty much it. I should have asked tons of questions (when she asked me if I had any) but at that moment I smiled weirdly at her, looked happy like we were talking about vast quantities of chocolate truffles and flat-lined out of the surgery thinking…. WTF is an enlarged heart? b) No enlarged heart was seen on the x-ray in the hospital in America when I was admitted with pneumonia. This could mean that IF my heart is actually enlarged it most likely happened recently and probably due to the pneumonia, which is good because it’s been caught early and may well revert back! I’ve been talking to people who’ve had pneumonia and developed an enlarged heart. Some made big lifestyle changes and reversed the enlargement, some people went further into heart failure. MAYBE the x-ray was wrong? Maybe I was stood at an odd angle and things appeared not as they are? MAYBE if I lose a bunch of weight over the next month while waiting for the echocardiogram and eat super healthy and sleep 10 hours every night everything will be back to normal by the time the test comes around? AND if everything is hunky-dory and the enlargement was temporary due to the pneumonia then actually let this be known as the universe sending me another HUGE WAKE-UP CALL and for that I will be enormously grateful. If you are the winner or runner up of the ‘1940s Giveaway’ please make contact. I will make contact with you before the weekend and once I have your address will send off the winners prize and runners up prize too. Thank you to everyone who entered and shared. This came out amazingly well for an eggless cake and I added a sugar glaze to add a little extra decadence which was really nice and was so simple to do (a couple of dessert spoons of sugar dissolved in about 150 mls of boiling water and simmered for just a minute and drizzled over). I used dairy free margarine and soy milk so this recipe is also suitable for vegans. The whole cake cost about 50 pence to make so great value for money! Add all dried ingredients making sure the flour is sieved and everything dry has been well mixed. Stir in warm milk and beat well. Place in a 7 inch deep tin. Bake in a moderate 180 C for 1.5 to 2 hours.